Chairman: Item six on the agenda: the meaning of life. Now, uh, Harry, you've had some thoughts on this. Harry: That's right. Yeah, I've had a team working on this over the past few weeks, and, uh, what we've come up with can be reduced to two fundamental concepts. One: people are not wearing enough hats. Two: matter is energy. People are not wearing enough hats!! I totally agree!! 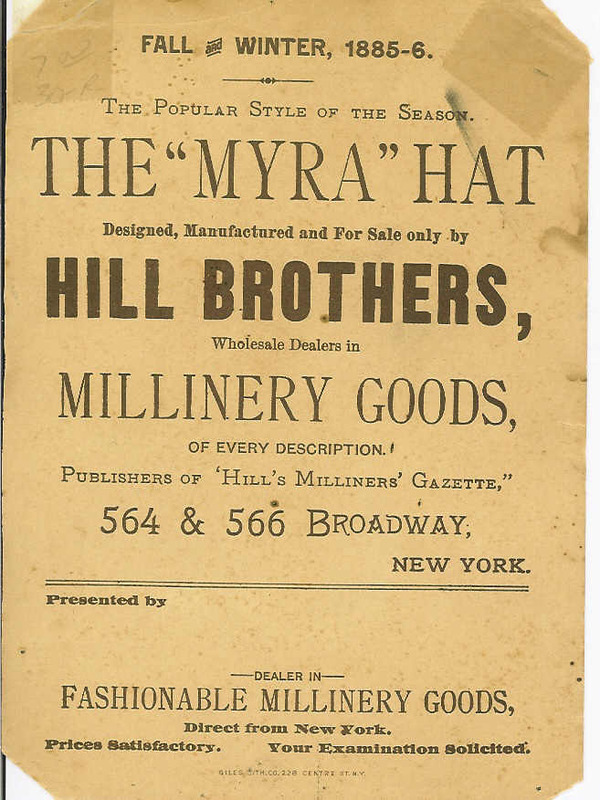 All those exclamation points might lead you to believe I am passionate about hats - and you would be right. I love hats!! 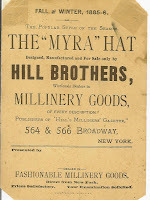 The card above is a treasure of mine from 1885 - a time when hats were as necessary to proper dressing as a pair of shoes. It is said that the day John F. Kennedy showed up hatless on his inauguration day was the day hats stopped being cool. But as I look around I see hats being cool again. Have you seen the new Target commercial? "I totally wear hats." says the shopper. Yay!! Is there a current interest in hats? Oh yes! So much so that the class was completely full for the 2-day Saturday and Sunday session and extended for a Monday and Tuesday session. When you see Jan's classes offered around the country, sign up quickly. Next class will be silk flower-making with tools that are just being re-introduced to the market. See you there! 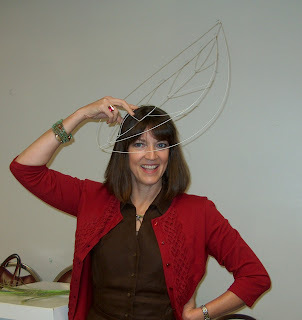 After some introduction to the terminology, materials, supplies, and millinery suppliers, Jan had us creating our first wire frame "headband" before our second cup of coffee. A simple head measurement, some simple math, some snips and wrapping wire and we had our first creation! As millinery wire is only available in white or black, we learned how to wrap our wire if we were going to use an open frame or cover our frame with a shear fabric or lace. This is my first piece wrapped in 1/4" satin ribbon. We learned many techniques for finishing the wire frame hat using many different materials. This frame is wrapped with 1/2" white organza ribbon weaving in and out of both sides of the frame. 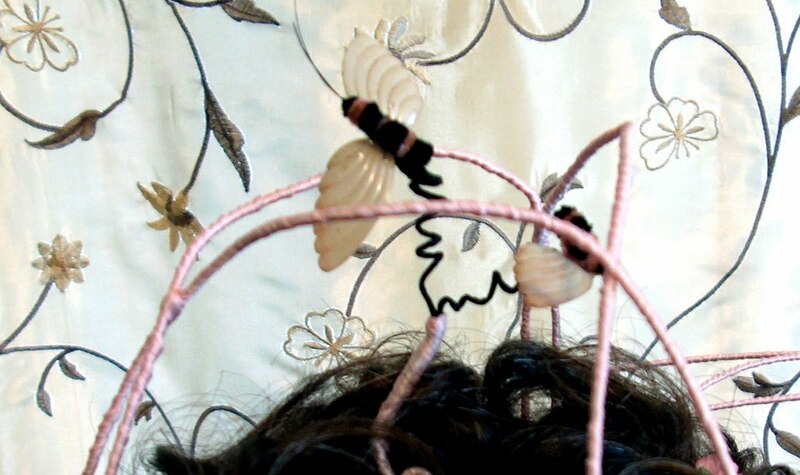 Adding some satin rosebuds and organza ties makes a simple but striking headpiece. Now that we've had a little practice we're ready to start on something more creative. Jan shares a vintage wire frame hat with us and explains the use of the different gauges of wire to support the shape we desire. Some more discussion and we're off! Although I know I will be making hats from the 1860s through the 1890s, I decide to try something more freeform and modern to test my new skills. In preparation for a spring Garden Tea Party I create a rose-shaped hat. Starting with the brim and crown shapes I draw my supports on paper and then cut and assemble the wire. 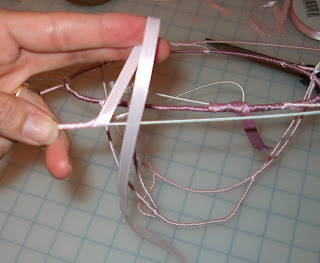 The rose-shaped wire frame is then wrapped in shades of 1/4" pink satin ribbon. After many hours of wrapping the frame is finished. There will be four hats for the spring Garden Tea Party: this rose hat, a lavender iris hat, a yellow daffodil hat, and a white daisy hat. They will all be open frame but some ribbons and feathers may be added once the gowns are complete. Learning this technique has opened up a new world of Victorian hat making. 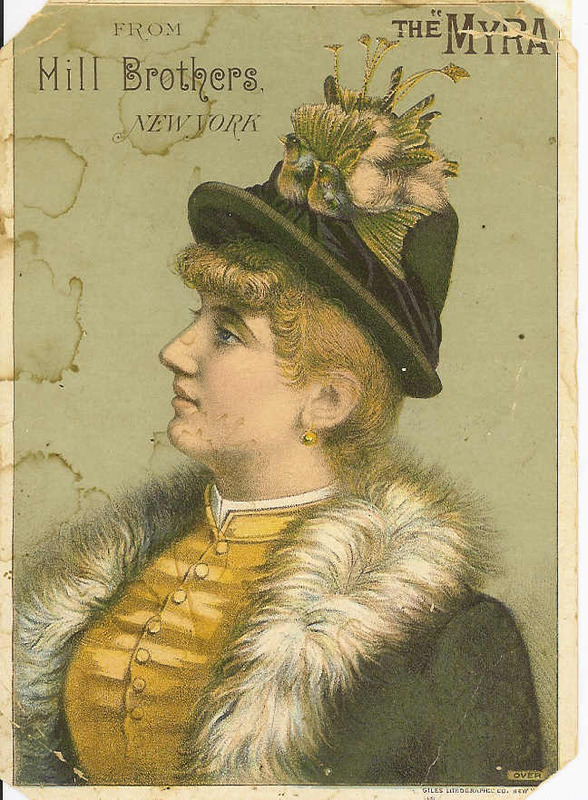 This beautiful hat from 1891 is a perfect example of the flexibility of wire frame construction and would be gorgeous covered with black lace. 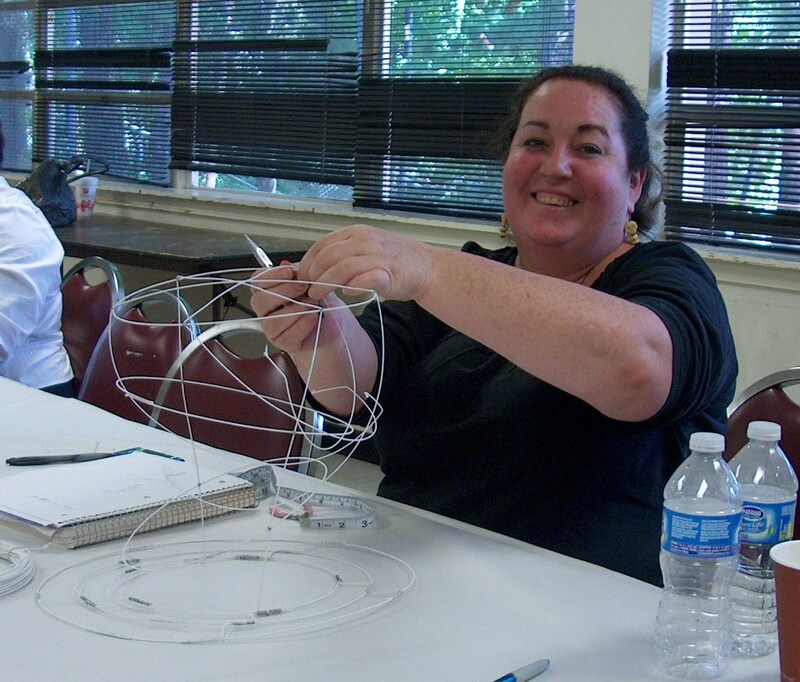 ﻿It was wonderful to learn wire frame hat-making and made even more wonderful meeting the talented folks in the class! Andre, Paula, Maggie, Shirley, Diane, and Rebecca - thank you all for making the class so enjoyable! Thank you Jan Wutkowski for sharing your talents with us all!